Fall means college football, late season barbecues, and pumpkin spice lattes at local coffee houses. It also means a maintenance list a mile long. Get ahead of outdoor home maintenance this fall with these tips on fall gardening. Clean it up. Nothing ruins curb appeal faster than piles of leaves decaying in the yard. What’s worse? Leaves clogging the gutters. Before trees start dropping leaves, install a gutter guard to block debris. Trust us, you’ll have a much better September if you’re tailgating instead of climbing ladders and cleaning gutters. Store garden equipment. Not only does a garden hoe look terrible lying in the lawn, exposure to the elements makes even the sturdiest equipment rust. Save your wallet (and your property value) by cleaning garden tools after you use them and storing them in a covered shed. Maintain the mower. Many homeowners simply stick their lawn mowers in an empty shed at the end of autumn. Those same homeowners are often surprised to find their machinery malfunctioning come spring. Save yourself the hassle by properly maintaining your lawn mower. Clean away grass clippings after every individual use. Before storing it for the season, drain the gas, check spark plugs and exhaust vents, and make sure it’s not exposed to the elements in its new winter home. Let nature do its thing. Why pay to fertilize the lawn when nature does it for you? 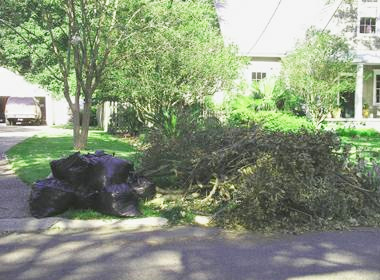 Grass clippings and fallen leaves provide all the benefits of fertilizer and mulch. They stifle weeds, release nutrients into the soil, and help the lawn retain moisture. Use leaves and grass as organic fertilizer early in the season, but don’t forget to clean them up before Thanksgiving. Encouraging plant growth late in the season leads to winter shock in most plants. Mr Junk hauls organic debris, leaving your yard looking better than ever. Giving your garden a seasonal makeover is as simple as cleaning, calling, and hauling!